A largely cordial race turns lively as all four candidates to succeed Gov. Paul LePage confront hot-button issues to set themselves apart from their rivals. In a debate that included several heated exchanges, the four candidates hoping to replace Republican Gov. Paul LePage squared off on key issues such as abortion, climate change, sexual harassment and health care Wednesday evening at the University of New England’s Portland campus. Sitting side by side, Republican Shawn Moody and Democrat Janet Mills sparred over climate change. Mills implied that Moody was a “climate change denier,” an assertion that Moody rejected. Independents Alan Caron and Terry Hayes, meanwhile, said they had no doubt the climate was changing and it was affecting Maine, its economy and its people. A question about energy spurred the lively exchange between Mills and Moody. Mills pledged to pursue a policy “that weans us off of fossil fuels as soon as possible,” and then went after Moody over his position on climate change. 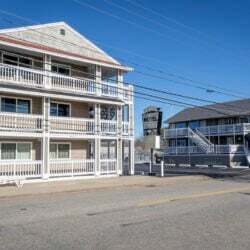 In particular, Mills seized on Moody’s comment at a Rockland fishermen’s forum that it was important for the government not overreact to climate change and help industries navigate the challenge. 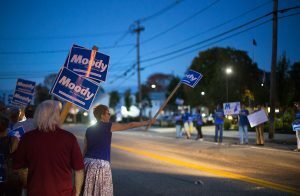 In response, Moody pointed to his company’s work with Maine Audubon at the organization’s Falmouth property on a major renewable-energy project, and said his company has “an incredible” reputation on the environment and renewable energy. 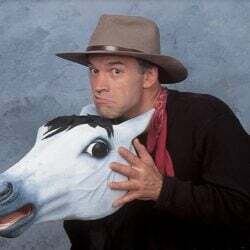 “For anyone to say in this day and age that anyone is in denial of climate change, that is such a ridiculous statement. It doesn’t even merit a response,” Moody said to cheers from his supporters but jeers from the Mills crowd. 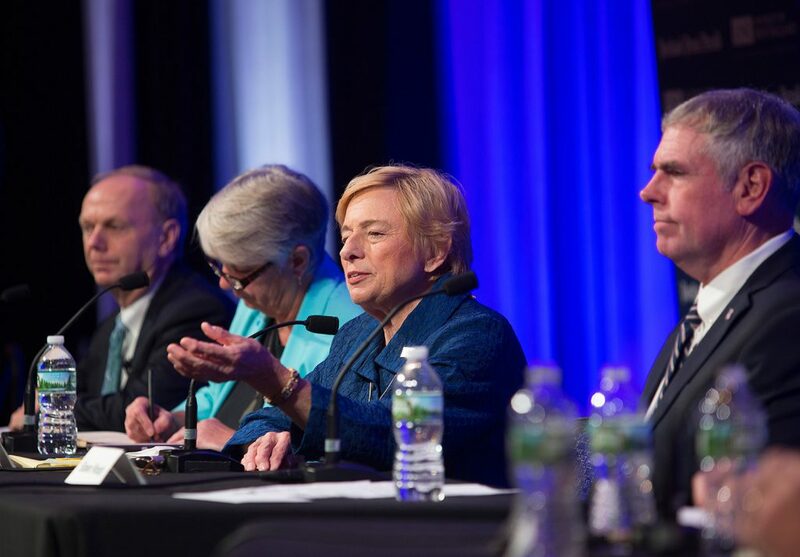 Democratic gubernatorial candidate Janet Mills answers a question during Wednesday night’s debate. To her left are independents Alan Caron and Terry Hayes, and to her right is Republican Shawn Moody. In a June debate with Republican candidates before he won his party’s primary, Moody said he did not believe human beings were causing climate change. But Moody also took heat for not fully answering questions, at one point being heckled from the audience for not answering a question precisely on what state resources he would deploy to help lower student debt in Maine. Hayes said she would focus on helping students not get into debt in the first place by being ready to succeed in college when they got there. Moody said he would put more emphasis on allowing young people to decide to work in “blue-collar” jobs and with their hands, instead of being pushed toward expensive college degrees that they may not finish or that may not provide a pathway to well-paid employment. 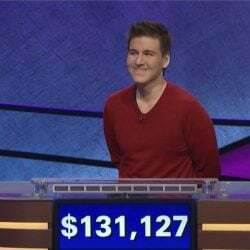 He also said private companies should be responsible for student loan forgiveness programs, noting many already offer hiring bonuses of up to $10,000. 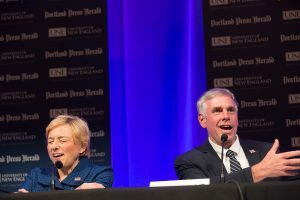 Democratic candidate Janet Mills reacts as Republican candidate Shawn Moody offers a rebuttal to one of her statements during the debate. Polls show the two virtually even in the race. 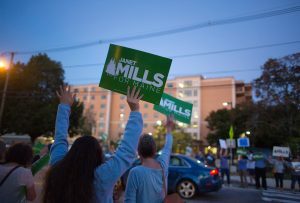 Mills said she would develop programs to provide income tax relief to workers who have degrees and were returning to work in Maine, and would give tax incentives to companies that help workers with their student debt. The candidates took strong stances on abortion rights. Mills, Caron and Hayes said they would protect a woman’s right to an abortion, and Moody said he does not believe taxpayer funds should be spent on abortion. The candidates were asked their positions on two abortion-related issues. The first was whether they would support attempts to impose tougher regulatory standards on abortion clinics, a move in conservative states that critics contend is an overt attempt to force clinics out of business. The second bill, which has been discussed in Maine, would allow physician assistants to perform early term abortions without a doctor present with the use of pharmaceuticals. Caron gave perhaps the most passionate response, saying he doesn’t understand why conservatives push for government to “get off our backs,” but are “right in the middle” when it comes to abortion. Caron said he would not support any measures that interfered with a woman’s right to choose to have an abortion. Moody said he believes physicians should be involved in abortion procedures, but he would need to do more research on the regulatory standards issue. The crowd of about 700 people watches the Maine gubernatorial debate Wednesday night at the University of New England in Portland. “The other thing I would not support is taxpayer dollars going toward abortion,” Moody said. But on the issue of physician assistants performing abortions, Mills said she helped to draft the measure to increase access to health care – not just abortions – in rural Maine. But those decisions should be made by licensing boards, Mills said. 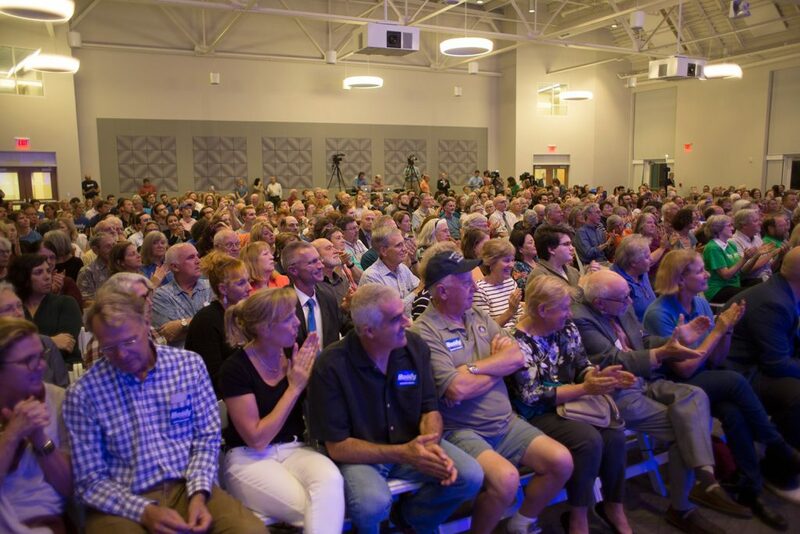 About 700 people attended the event, co-sponsored by the Portland Press Herald and UNE, in one of the most high-energy appearances of the candidates, who have appeared together more frequently in recent weeks. While the fundraising and advertising race is heating up, the 2018 governor’s race has been relatively low-key so far. The candidates were also asked if they would hire somebody to their staff who was facing a credible allegation of sexual harassment or assault. Mills said she would issue an executive order on her first day as governor saying she would never interfere with investigations or findings of the Maine Human Rights Commission, unlike LePage, who has injected himself into several cases involving discrimination charges against businesses in Maine. Supporters of Shawn Moody get their message across before the debate. Moody pointed to his company’s policy and practices and noted he seeks to empower his female co-workers at all levels of his business, and said as governor he would fully vet any possible employees, including making sure they were not felons. Both Caron and Hayes said they would disqualify an applicant if they learned of a credible allegation of sexual harassment or assault. In a final question, the candidates were asked which of their opponents they would bring into their new administration were they to win. Supporters of Janet Mills make their feelings known before the debate. Mills at first said she wasn’t prepared to say who she would hire to her administration were she to win, but later said she could see all three of her opponents serving on a transition team. Caron said he would ask all three of his opponents to join his team, and quipped that the first thing they would do is take a Florida vacation together in the RV he’s been using as a mobile campaign office. “There are no demons on this panel. 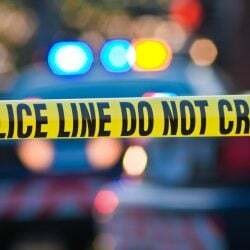 As much as some people would like to persuade you there are, there are not,” he said.